Mr. Justice H.L. Dattu, Chairperson, National Human Rights Commission, in the run up to its silver jubilee celebrations in 2018, inaugurated the 'Online Human Rights Pledge' today at a brief ceremony in New Delhi. This pledge can be taken by the people through MyGov portal from the 69th Republic Day of India on the 26th January, 2018 tomorrow. The pledge can be taken in Hindi or English. 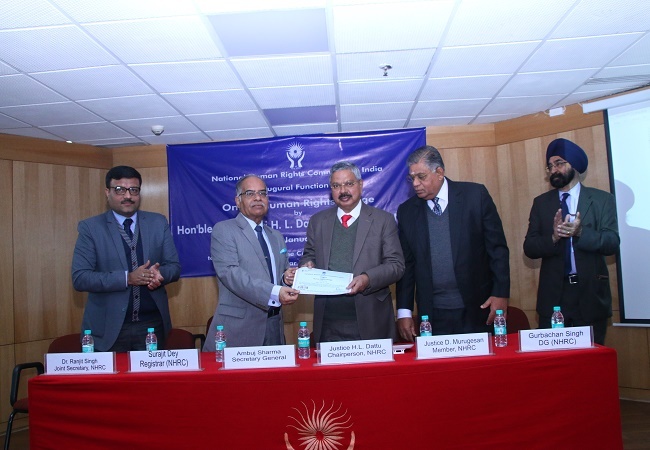 On the occasion, Justice Dattu, NHRC Member, Mr. Justice D. Murugesan, Secretary General, Mr. Ambuj Sharma, Director General (Investigation) Mr. Gurbachan Singh and Registrar (Law), Mr. Surajit Dey were among the first few, who took this online pledge. The people shall get an automated certificate in their names immediately after taking the pledge to protect and promote human rights of all by filling in certain basic personal information online to complete the process. They can download or take out its print. The people can also share their certificates of Human Rights Pledge on Facebook and Twitter through MyGov portal. This initiative is aimed at inculcating a sense of self commitment among the citizens towards the promotion and protection of human rights and build widespread awareness about the importance of the same throughout the country.